I’m heading into a week of fieldwork for a luggage brand to understand attitudes and behaviour of bag-packing. 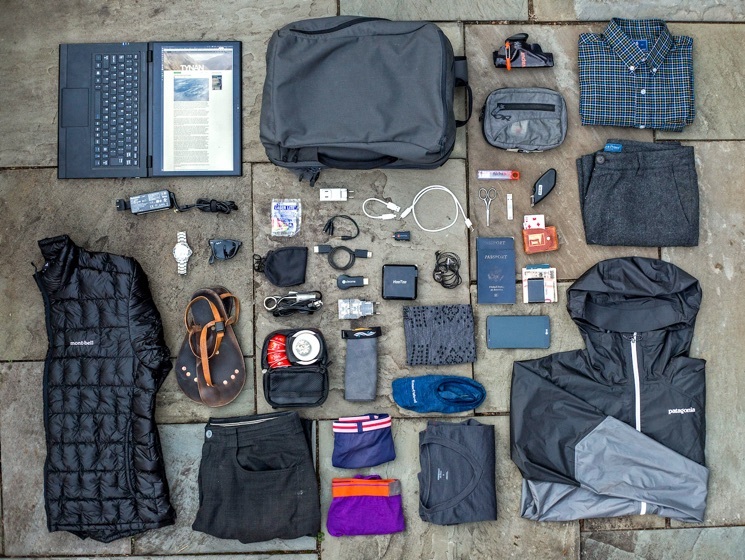 Tynan’s obsessively-honed and considered 2016 packing list was viewed over 60K times. Yep. Now, I’m not averse to making a list myself (Here’s what’s in my design research kitbag) and I’m a carry-on traveller too. I even have a toothbrush for travel and one for home. I have an opinion. …I guess that makes me biased? But this bias I’m supposed to leave at the door… It provides a benchmark. It brings me closer to the realities of the people I’m trying to understand. It’s why design researchers intentionally immerse in the customer’s context. To be able to relate and compare. On one hand I’m trying to be an empty vessel when discovering a person’s world, but my own experience is a valuable frame of reference, too. I see ‘checking’ this as akin to accepting it — being self-aware — acknowledging my viewpoint but carefully judging how much of it I reveal to the people I’m trying to understand. The last thing I need is for them to assume I totally relate to them, speak in short-hand, or hold back from explaining the why behind they do what they do. Or to let my own experience blinker me or funnel toward the familiar. We Kiwis can double down on that. 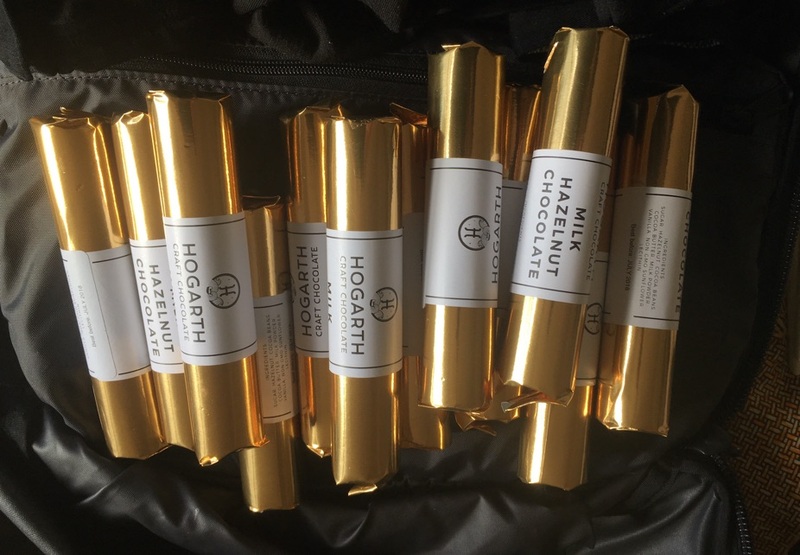 My bag is automatically 20% lighter on the way home from the offloading gifts of honey, peanut butter, wooly bits and other local delights to friends, and research participants. I’m analysing what every item says about me, and why I don’t have a special compartment for my biases?. (Top photo was taken in the Mission, SF. 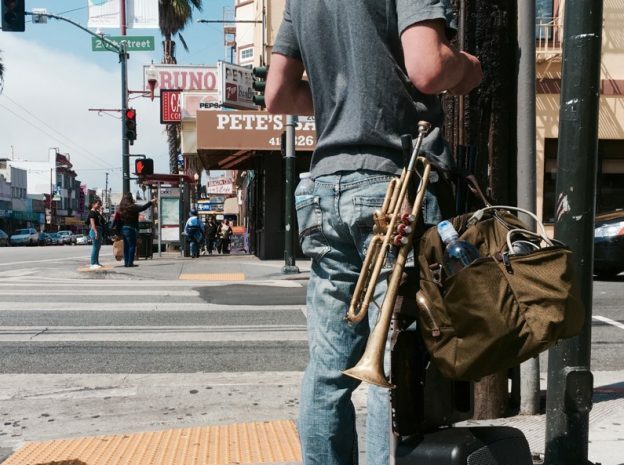 I love how this busker is using his tripod as a kind of ‘holster’ for his trumpet, like a gunslinger in a duel. Keep the backpack stuffed with NZ honey Nick. We enjoyed the last delivery!